In this article, I want you to get the information you need to find the best light stroller for travel ! 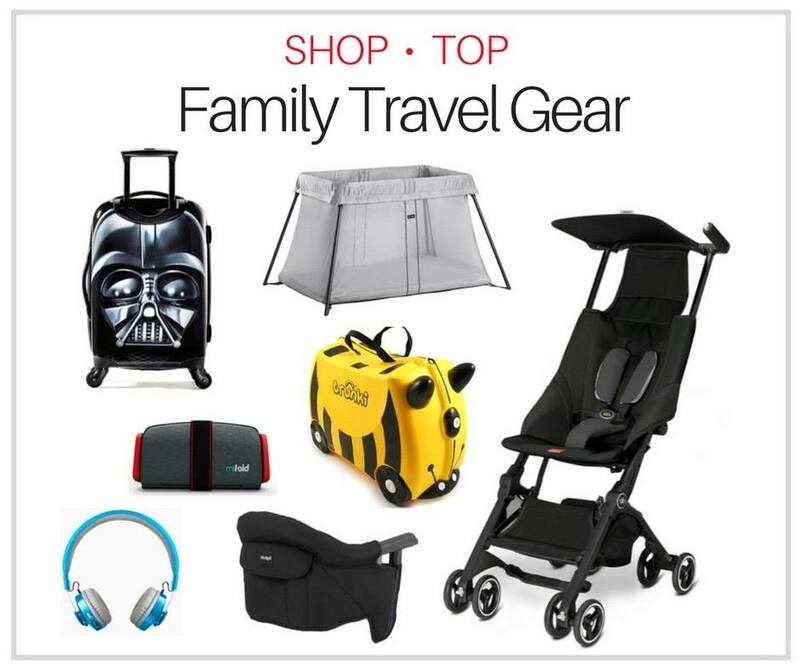 Whether you are looking for the most compact baby travel stroller (that will fit in the overhead bin of a plane), the best infant travel stroller or the best travel umbrella stroller for a lengthy trip overseas, these foldable stroller options will have you covered. 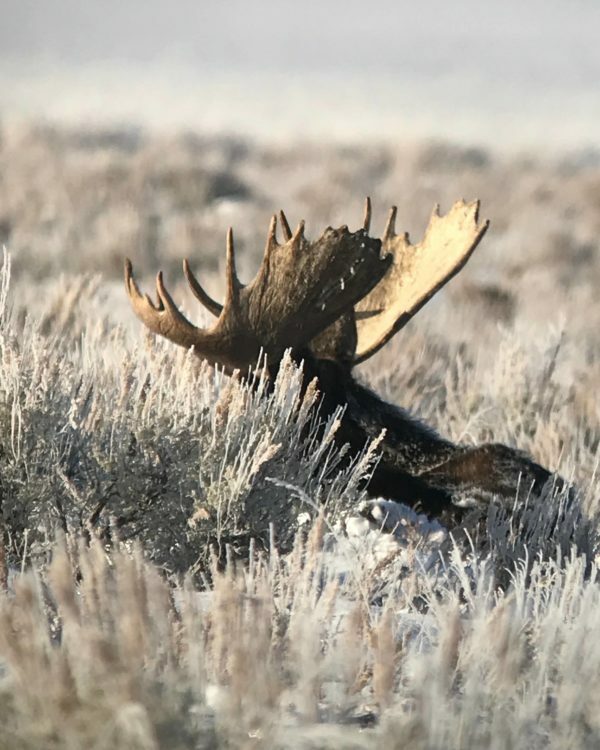 Not in the right place? 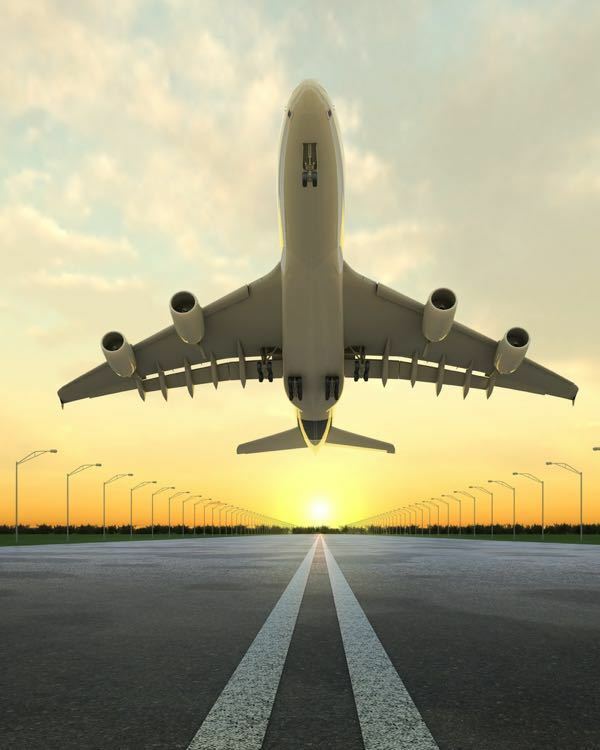 If you are looking for airplane car seats instead, please see this post on the best travel car seat options for 2019. Getting through the airport and onto an airplane with an infant or baby can be challenging, but having the right travel gear, such as the best stroller for airplane travel, can make your experience so much better. While there may not be one perfect solution for flying with a baby, we want to get you as close to perfection as possible. Here are Pint Size Pilot’s top picks for the best small stroller for travel in 2019. Learn a little bit about finding the best travel stroller for flying, or go straight to the list. While you may be allowed to store a lightweight travel stroller in an overhead bin on a plane, technically, most good travel strollers do not fall within the carry-on luggage required size dimensions (see exceptions below.). It is much more likely that you will be asked to gate check your lightweight baby stroller (picking it up again as you exit the plane). For this reason, I don’t think you should shop for a foldable stroller for travel based solely on it fitting in an overhead bin. The maximum allowable weight and dimensions of a gate checked stroller vary by airline, so I encourage you to check with your carrier before flying. I would, however, avoid traveling with a stroller that is large, expensive, and needs to be checked with your regular baggage. If you ever take a walk by the oversized baggage pickup area in an airport, you may recognize a wide variety of broken stroller parts. Gate checking your folding stroller for travel in a decent stroller travel bag would be my strong advice . Disclaimer: Despite the fact that most airlines have strict policies about strollers, I still occasionally see a person rolling their baby around at the gate in the most gigantic stroller that they then gate check without a problem (primarily in the USA). This, however, is the exception, not the rule. Personally, I always found that having a lightweight baby carrier along during travel with an infant was also very helpful. Sometimes my kids would get restless and cranky in an airport while in their infantl travel stroller (especially if we were nearing nap time) and just needed to be close to mom (or dad). In these cases I was always glad to have a lightweight travel baby carrier on hand, usually just tucked into the bottom of the stroller or in my diaper baby. Please just be aware of the fact that you are not allowed to keep your baby in a baby carrier during takeoff and landing. 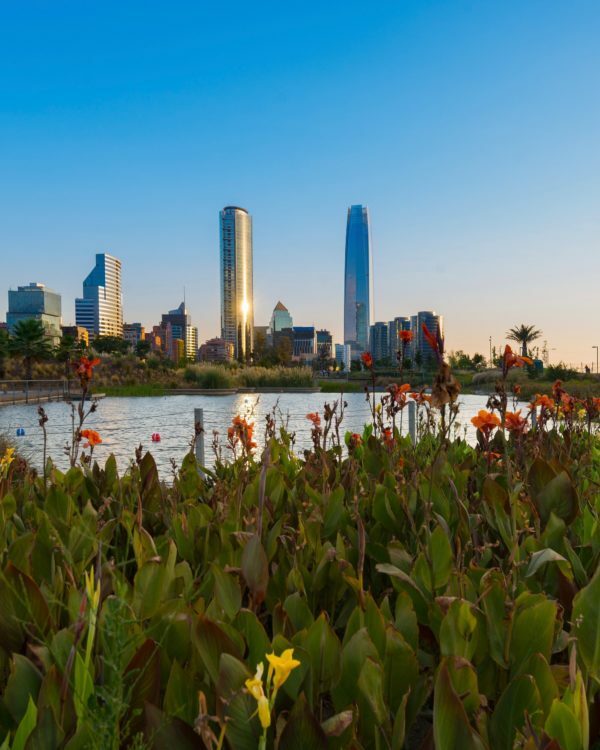 Many parents find that they purchase a light and easy stroller for travel as a secondary stroller, but due to its light weight and ease of portability, it quickly becomes their favorite. With that in mind, when comparing strollers, you may want to consider spending a little extra to get all the features you need. Here are some of the most desirable features in a fold up stroller for travel. Lightweight: The lighter the travel stroller, the better – without giving up too many features (stroller features add weight !) Most are around 12 lbs, but some of the best strollers for air travel go as low as 10 lbs. A Five Point Harness: Keep your baby secure with a 5 point harness that ideally converts to a 3 point as they grow. Option to Recline: An reclining travel stroller is very useful for naps on the go. Please note that only strollers that recline to flat (or have an option to add a baby bassinet or infant bucket car seat) are suitable for use as a newborn travel stroller. 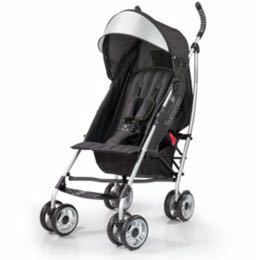 If you are looking for the best travel stroller for an infant, be sure to look for the full recline feature. Extra Large Shade Canopy: An extendable or adjustable sun canopy is a nice feature if you are visiting somewhere hot and sunny. Air Vents: It is also nice if the travel stroller has an option to zip open an air vent to keep your child cool in hot weather. Foldable: You should not have to fight with your stroller at the gate or at security screening. You should be able to easily fold up your stroller for airplane travel (and it is even nicer if it can stand up on its own). I encourage you to read reviews when considering a travel stroller as purchasers will be sure to mention this if it is an issue. Large Storage Basket: Let’s face it – traveling with an infant or baby involves stuff. A large storage basket under the stroller can be quite useful. As your child get older, you may find yourself accumulating even more stuff. It is very easy, for example on a beach trip, to end up with a toddler travel stroller full of all kinds of gear (umbrellas, pails, sunscreen etc.). A Stroller Carry Strap or Carry Bag: When traveling with a stroller, it is nice if you can just sling it over your shoulder when not in use. Likewise, to protect your stroller when gate checking it, you may want to invest in a stroller carry bag. 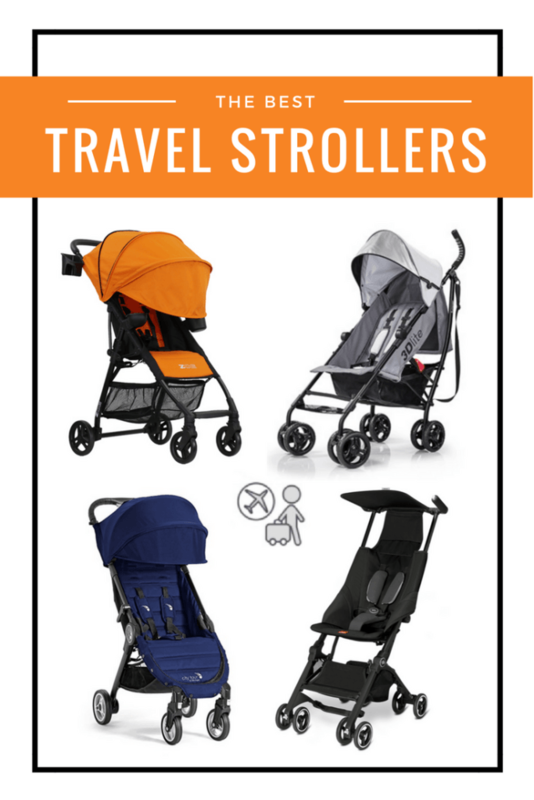 Although every recommended travel stroller is described in detail below, I have created this table so you can do a quick travel stroller comparison. Click on any highlighted heading to sort the strollers by your preference. 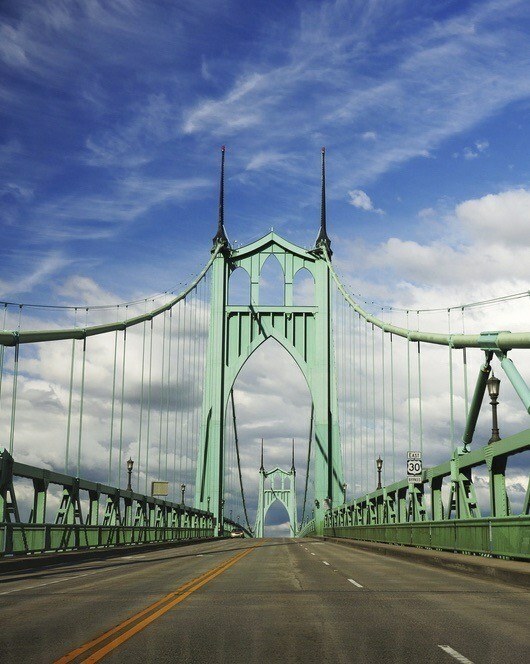 For example, if you click on the price heading, it will sort the cheapest travel strollers to the most expensive strollers for travel. Click again, and it will reverse the order. Good from 6 months to 50lbs (22.6 kg) making it a good travel stroller for toddlers too ! 4.5/5 stars from reviewers on Amazon. Award winner in the category of best lightweight umbrella stroller for travel. Folded dimensions are 10″W x 9″D x 43″H (25.5cm x 23cm x 109cm). 4 position recline (not quite to flat though). Cup holder and storage pocket. Adjustable and removable canopy with flip out sun visor. Extra-large storage basket and rear storage pocket. Easy compact fold with carry strap and auto lock. Want to learn more about the Summer Infant 3D Lite travel umbrella stroller? See this demo video. Reviews and further details about the Summer Infant 3D Lite Stroller here. Claim to fame: Currently the lightest travel stroller on the market. Suitable from 6 – 36 months (or up to 33lbs). 4.5/ 5 stars by reviewers on Amazon.com. Folded dimensions: 22″W x 12″D x 11″H (53cm x 30cm x 27cm). Easily fits in airplane overhead bin. One hand pushing and steering. Comes with a storage bag (that can act as a seat for parents). See a demo video for the Besrey Airplane Stroller here. Reviews and further details about the Besrey Airplane Buggy here. Please note: The Besrey Airplane Stroller does not recline, which I realize may be a dealbreaker for some. Claim to fame: One of the lightest travel stroller options. Fits in most overhead bins on planes. Weighs only 11 lbs ! Good for child 6 months to 50lbs (22kg). 4/5 stars from reviewers on Amazon. Folded dimensions: 20.25″W x 6.5″D x 26″H . Stroller fits in most airplane overhead bins when folded. Child cup holder, child snack cup and parent cup holder included. 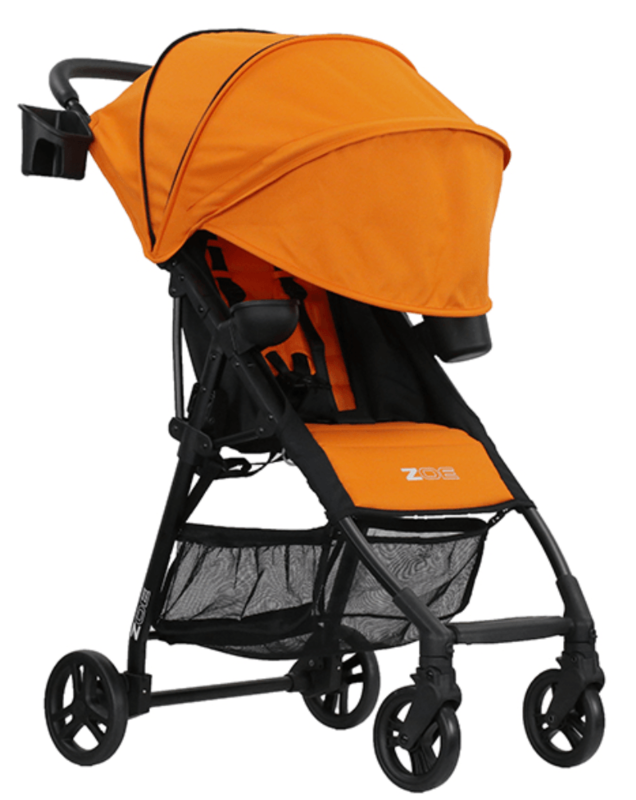 Reviews and further details about the Zoe XL1 Best V2 Stroller here. 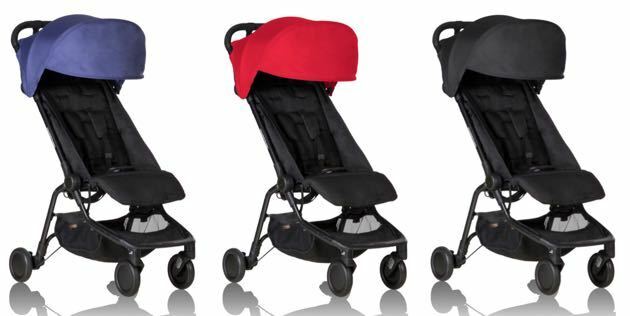 Note: The Zoe is also available in a 16 pound double lightweight travel stroller for twins ! 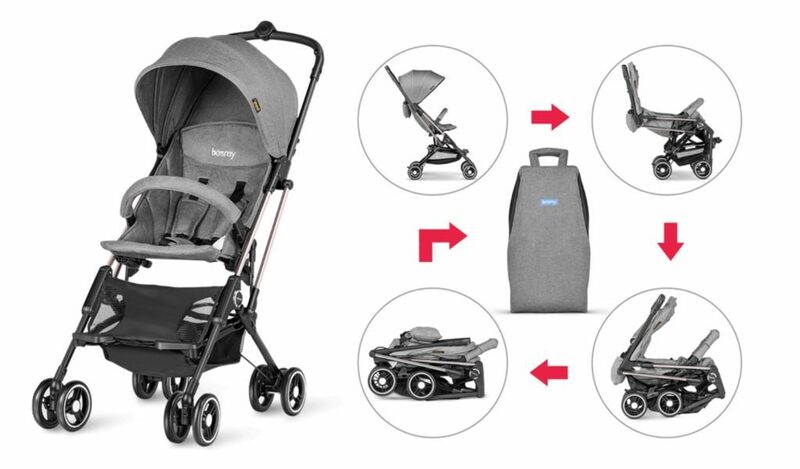 Read reviews and learn more about the Zoe XL2 Double Stroller here. Claim to fame: Best travel stroller for infants as it is suitable from birth and car seat compatible ! Weighs 17.75 lbs ( a little heavier than some others, but has some great features). Suitable for children up to 50 pounds. Folded dimensions: 11.5″ W x 16″D x 43″H (29cm x 40.5cm x 109cm). Full flat recline option so you can have baby in stroller from birth. 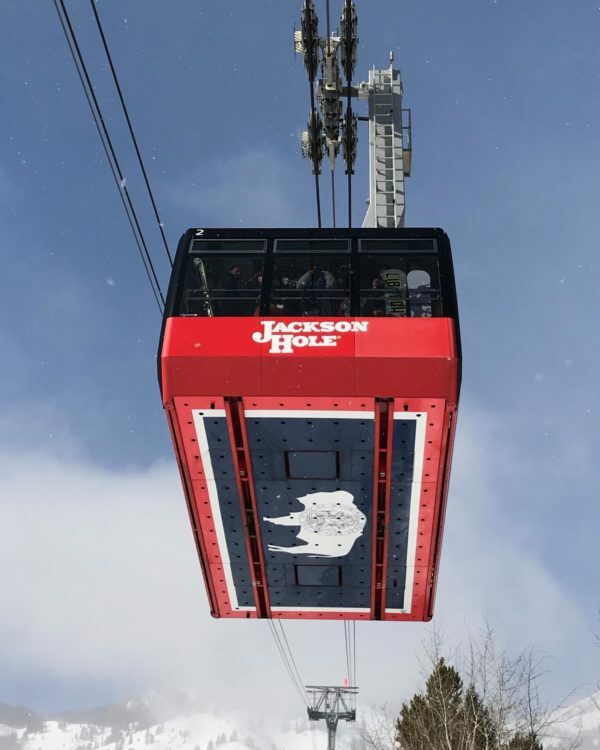 Extra-large canopy with a visor extension and peek-a-boo window plus UV 50+ protection. Exclusive one-hand fold makes this the easiest folding umbrella stroller. 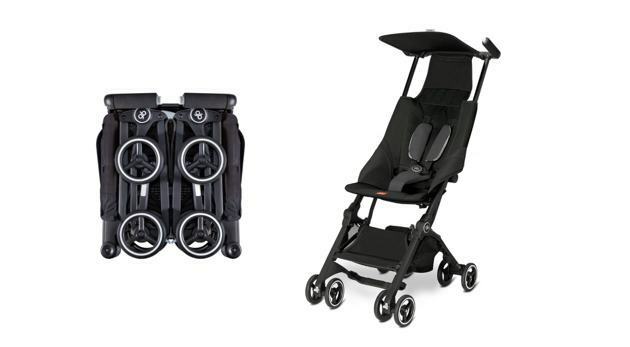 Easily accepts all Graco Click Connect infant car seats with a secure one-step attachment to create your own travel system. Want to learn more about the features of the Graco Breaze Click Connect Stroller? See this product demo video. Reviews and further details about the Graco Click Connect Stroller here. Claim to fame: This stroller fits in an airplane overhead bin and comes with a cool carry backpack. Weighs only 14lbs – perfect for airplane travel. Suitable for babies and toddlers 6 months to 45 lbs. Will fit in the overhead bin of most airplanes. Comes in 5 modern colors. 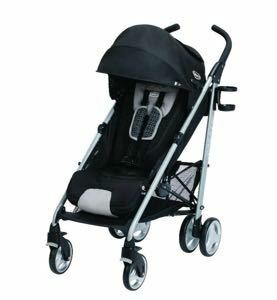 Read more reviews and get further details about the Baby Jogger City Tour Stroller here. Claim to fame: The world’s smallest folded stroller. Loved for its compact convenience on buses, in subways and on airplanes. Suitable from a 6 month old baby, to a child up to 55lbs. Want to learn more about the features of the award winning GB Pocket Stoller? See this video. Claim to fame: The luxury choice. All the top features and excellent quality. Suitable from birth with infant cot or infant car seat (see compatibility below) to 44 lbs (approximately 4 years). Folded dimensions: 22″W x 12″D x 20″H (56cm x 30cm x 51cm). Easy 1 step open, compact 2 step fold (will fit in overhead bin on airplanes). 2 position recline with air vents. Large sun canopy with flick out mesh sun visor. Built in car seat adapters. Lockable swivel or straight front wheels. 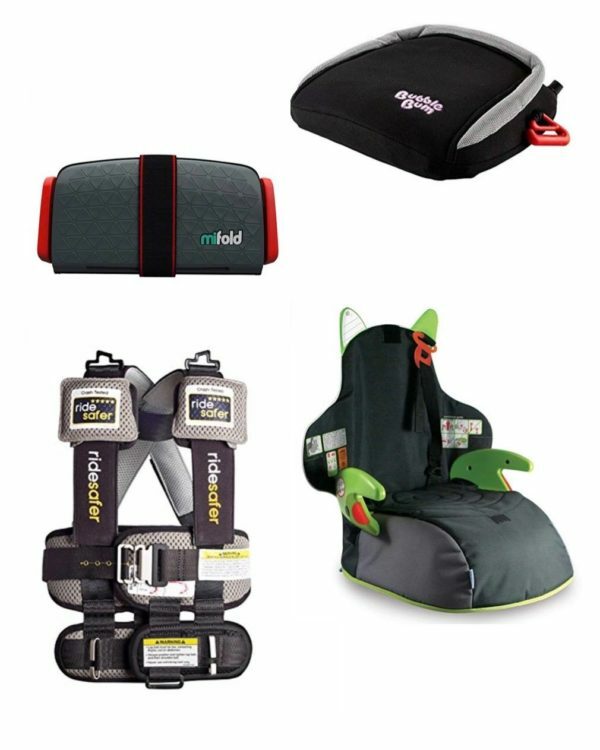 Includes a universal car seat adapter (see Nano car seat compatibility list ). Reviews and further details about the Mountain Buggy Nano stroller here. Hi! Thanks for sharing this information! I’m trying to decide which stroller is best for us to take our 1yo girl to a 2week trip to Europe in August. I’ve been considering the Zoe XL1, Maclaren Mark II, Mountain Buggy or just keep the Zobo we currently have. I’m looking for something light, with enough reclining for naps and good wheels for cobblestone or uneven terrain. What would you recommend? I also thought that being able to take it with us on the plane was a good feature, but now I think checking it at the gate wouldn’t be that bad, right? 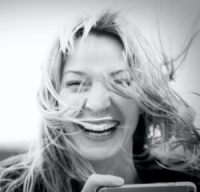 Hi Maria! How lovely that you are off to Europe. I’m sorry, but I don’t know a lot about the Zobo. I will say, however, that for Europe it is really all about the wheels and the size of the stroller (smaller = better). The wheels (and suspension) are important for those cobblestone streets and the size because, well, everything is a little tighter over there (restaurants, cars etc.). 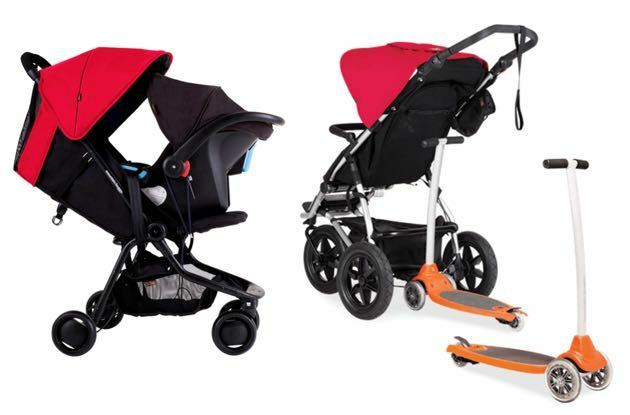 Both Maclaren and Mountain Buggy are good choices. We always gate checked, but it is nice if you can put your stroller in a stroller bag for extra protection of parts (some strollers come with them). I would just avoid checking with regular luggage (at check in). A double stroller great for travel. My 3 year old and 7 month old will be travelling with us to North Africa and I just know they will both need use of a stroller. Or do you recommend me and hubby each push a single. Help! I wish you could see the whiteboard in my office. On it there is an item “double strollers” under “posts I need to write”. It has just sadly been there for a really long time. I understand your conundrum well. I’m not sure how familiar you are with North Africa or the developing world in general, but I’m a little concerned about the quality of the road/sidewalk infrastructure. Strollers are great when there is a good surface to roll them upon. Having traveled a fair bit in Mexico when my kids were little, there was a lot of picking up the stroller when the sidewalk ended, broke apart, or simply didn’t exist. I think it is important to have that kind of expectation for North Africa (unless you are staying at some swanky resort like the Four Season with impeccable grounds). 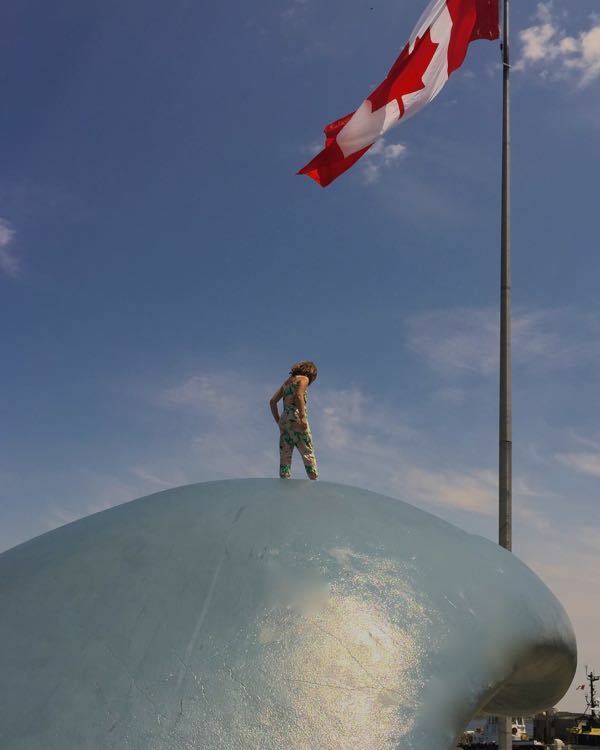 If it were me, and after conferring with a friend of two young children (who is familiar with North Africa). I would bring one good travel stroller (with a good sun shade) that could hopefully accommodate either child and a baby carrier (also with sun shade). The higher quality travel strollers, such as the Mountain Buggy Nano tend to have better wheels and handling on rough roads. I hope this helps F.eel free to email me directly as well at tara@pintsizepilot.com. Hi Nicola ! While I love the Pockit for its size and weight, the seat it quite narrow (only 9″!). Being so light, it also doesn’t have a ton of features such as recline or a sun canopy (not sure how sunny it will be where you are going). If there is one complaint about the Baby Jogger, it is that the seat is not deep enough. With your child being 3 years old, I would recommend the Nano. Now, that said, I would recommend buying it from somewhere that has easy free returns and I would try to sit your child in it (perhaps on carpet so wheels don’t get scratched), to make sure that you love it. As you already know, it is on the pricier side. I hope this helps ! 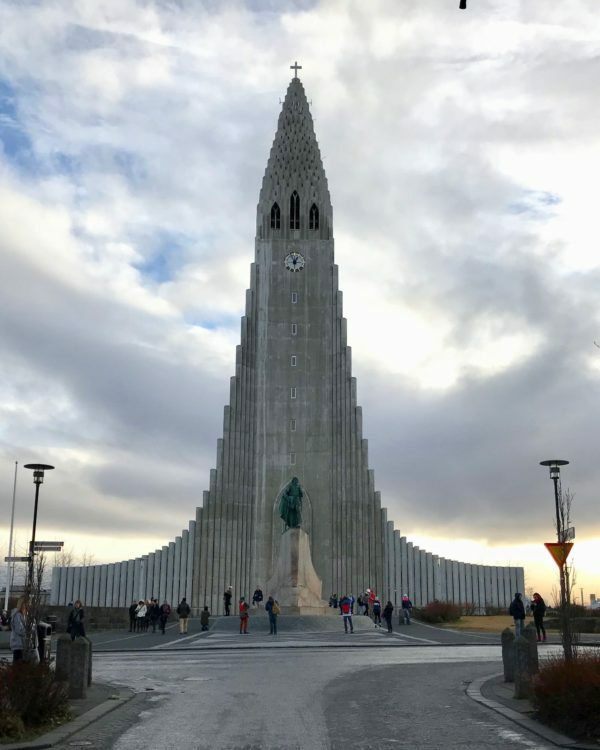 Have a great trip ! I have 3 year old so only need a travel stroller for another year or 2 for trips to NZ and Europe. We don’t travel that much only 2-3 times a year. I have a disability so can only use 1 hand well and light weight is important. I am torn between the kolcroft and summer d-lite. Is the kolcroft thin when folded ? I’ve heard you can hit your legs if you have a long stride but I’m not that tall. Over those 2 which would you recommend for ease of 1 handed use?. We have taken the britax b-agile to NZ but it was a mistake. That stroller is so hard to maneuver with the 1 front wheel. I need something that can be pushed easily with one hand since I have to push luggage around with the kids. What do you think would fit my need?